tips for a long range airsoft rpg? Alright I was just wondering if anyone had tips on how to make an airsoft rpg get better range. I want this thing to shoot nerf footballs and i want to be able to hit targets that are a loooooonnnnggg way away. I figured that if the barrel is longer that the projectile will fly further, but what about a detent at the end of the barrel would that help? 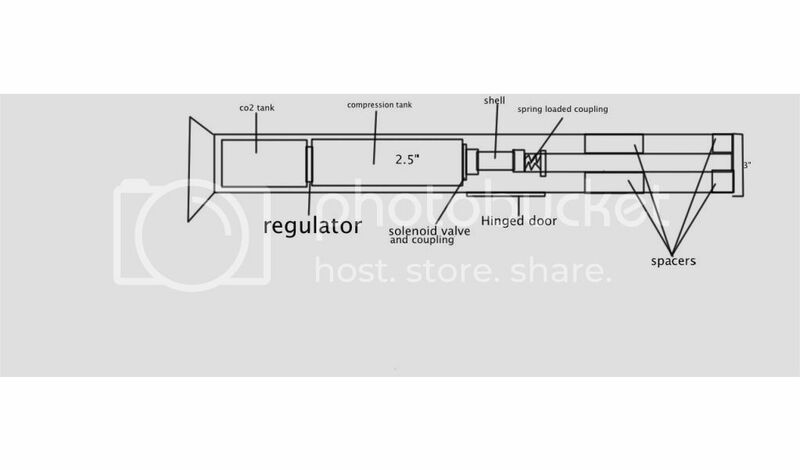 Also i plan to use a simple modified sprinkler valve as the firing mechanism but if there is another system that improves range i would like to know about it. Thanks for any input. You would need to add a bit of weight to the nerf football's seeing as they are foam, so that would help. I would recommend a piston valve as well. How about some more details on the chamber and stuff. You can increase the barrel length, the valve size, the pressure, and the chamber size up to the point you rip the vortex tails off in a high G launch. The durability of the vortex is your limit on power. When doing test shots to measure muzzle speed of a 4 inch foam ball, my bucket sustained some damage. one more question. I have a co2 regulator and a co2 tank how could i hook that up to fill the cannon's air chamber? warhead052 wrote: You would need to add a bit of weight to the nerf football's seeing as they are foam, so that would help. I would recommend a piston valve as well. How about some more details on the chamber and stuff. Not to be rude, but you're completely wrong. I built one two years ago, using a 3/4 inch sprinkler valve, with a 2 foot chamber, and a 1 foot barrel. I got a range of about 100-150 years (300 to 450 feet using low pressure that would be "hooked-up" to a CO2 regulator. ALSO, nerf rockets are VERY well weighted, and fly VERY straight at pretty high velocities. ALSO.. AGAIN. After using it in actual paintball games, I found out at 150 FPS, this thing left welt the size of baseballs.. It especially huts when shot in the balls.. I should know..
madmarcs wrote: one more question. I have a co2 regulator and a co2 tank how could i hook that up to fill the cannon's air chamber? one goes from the on/off to the regulator, the other from the regulator to your chamber. Make sure you have 1/8" thread on the chamber. you could make your own remote line with parts from Mcmaster, might be cheaper. The regulator i'm using currently is made by cobalt i picked it up at Lowes. Oh that's easy. Just add a male QD to the gun, and you're set. and then will have that pressurizing to about 125 psi or so a chamber of steel pipe. Then a modified sprinkler valve as the trigger. I want this thing to shoot nerf footballs and i want to be able to hit targets that are a loooooonnnnggg way away. Are there any considerations to milsim gamerules? Because that is where I am running into "issues" in design. GonzoInferno wrote: Are there any considerations to milsim gamerules? Because that is where I am running into "issues" in design. I would imagine they have a velocity limit, being shot by one of those 2 inch Nerf rockets doing 150 or so fps is not an experience you forget in a hurry. Even if you do boost velocity beyond that, don't expect to be knocking out targets in the next county. Berkut wrote: I have an idea for a large artillery field piece. I am reaching out for help from the community because I have ran hundreds of simulations in GGDT and the best I have been able to get from my current design has been about 800 feet at 500 psig. Ideally, range should be about 600-700 yards, using pre-loaded cartridges. Forget that sort of range using Nerf projectiles. The problem with a projectile for long range is that it needs to be good at "penetrating" the air - it needs to be of good aerodynamic shape, with a low frontal area and high sectional density - and these characteristics make it very good at penetrating flesh. This is why Nerf projectiles have the opposite characteristics, which makes them safe to use but very poor in terms of ballistic performance. My concerns are if people are playing airsoft or paintball on a piece of neighborhood property with their store bought weapons, all is somewhat ok. Official and dedicated facilities have mandated rules with chronographed velocities. However when someone brings in some homemade high power cannon to the neighborhood woods, common sence has already been left at home. I am not trying to accuse anyone of doing this (yet), it's just my concerns. I too am designing and building with technical advantage in mind but I don't want to say to someones family, "Sorry, I didn't think my shot would go thru the wall AND Jimmy."